This 37 hectare (91 acre) property is bordered on one side by the Agujas River flowing out of the mountains of the Osa Peninsula. 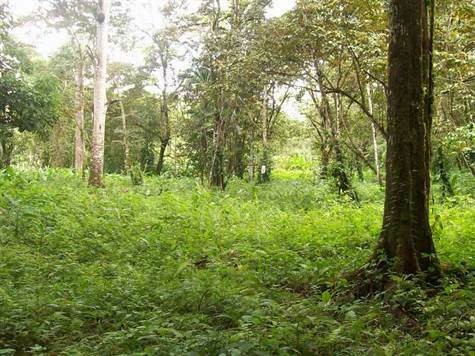 It is a combination of Primary Forest and maintained areas to facilitate use and/or development. Survey work has been done for possible lot subdivision that could provide a number of river view sites, a couple Golfo Dulce views and various forest settings. Road system to serve a development is mostly roughed in now for vehicle access through much of the land. If you picture yourself walking among giant rainforest trees, yet with plenty of area to construct your private amenities or eco lodge, this is something to see. An extensive Private Nature Trail system is a natural and will produce regular sitings of wildlife, being this close to Corcavado National Park ....... it is left up to your imagination of what you may see from large cats to hummingbirds. To enhance the eco lodge development of this piece is being 15 minutes from Puerto Jimeniz for full fishing and boating services, as well as various beach alternatives along Golfo Dulce. If you are looking to land bank funds this property will perform well in the medium term as the eco tourism industry of the Osa grows.